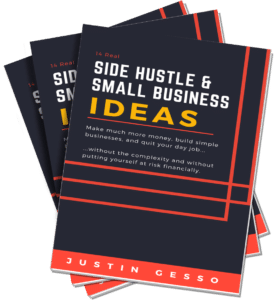 We’ve all heard the saying, “It’s not what you know, but who you know,” and if you want to start a successful small business or side hustle, you’ll need to live and breathe that saying. How important is networking for success? Probably way more important than you think. So dive in for some great networking tips and insight into how networking can make or break you. If I look at where I am today, it’s because of people. Once I developed the right mindset, all it took was connecting with the right people. And if you’re an introvert by nature, don’t worry. This is not about quantity of relationships, this is about quality and depth of relationships. 5 Ready to Improve Your Networking Game? 6 Bonus – Networking Makes You Happy! People provide support, connections, knowledge, ideas, and so much more. We progress and advance because we learn from those who came before. Your network gives you the ability to level-jump results, avoid pitfalls, and leverage others’ connections. In fact, this concept is so important that you’ll find entire coaching systems dedicated to them. One of the coaching programs I personally used spent 80% of its weekly focus on managing and dealing with people. It was the most expensive program I have done by a long shot, but it was well worth it. As I watch businesses succeed and fail—whether through my coaching, consulting, or day-to-day interactions—I can best gauge a company’s likelihood of continued success by observing the owner’s attention to people. This doesn’t mean you need to be an uber-charismatic person or a schmoozer (I certainly am not), but it does mean you need to deliberately make and maintain meaningful connections with people. Within your life, you will have a certain subset of people who enable your success. They fuel you with ideas, connect you with the right people, and literally drop opportunities in your lap. You need to identify these people, deliberately improve your relationship with them, and continuously be of service to them. Whom will you partner with? Who will beta test your products and services? Who will provide you funding? Who will give you testimonials? Who will buy from your business? The answer is people in your network. You need a strong network and you need to double down on your efforts to improve it today. Even if you plan to market a product solely to strangers online, don’t underestimate the role your people network plays. Proper management of your network is 100% critical. Spending big dollars on marketing and sales paves a risky, long road to building a business from scratch. But what if there’s a better way? When you rely on people within your network to grow your business, life is easy. You don’t need to sell. You don’t need to market. Your network does it for you. Because I know this, I spend my time working on my network and relationships. It doesn’t feel like selling to me. People get to know me, trust me, and understand what I do. If they need services I provide, it’s a no-brainer for them to use me. Likewise, they gladly market my services on my behalf—often without even realizing it. Referrals of this nature are gold. Forget pseudo science…this is how you make real magic happen. 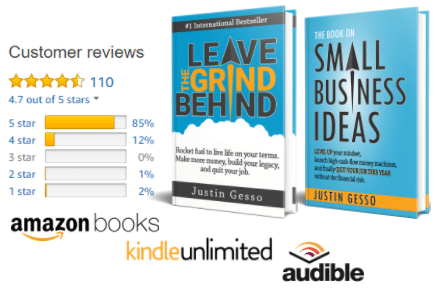 Get My Book “Leave the Grind Behind” Now! While networking wasn’t easy or natural for me, there are ways to approach it that work even for people like me and maybe you. If you haven’t thrown yourself into genuinely improving your network, you have to find a way. Consider this example of starting a marketing firm. You know an executive at a midsize company. You have history. She understands your expertise and trusts you. She is the decision maker and actually has a need for expanding the company’s marketing efforts, which so far have been minimal. As soon as you tell her you’re starting a marketing firm, she asks to meet for lunch to discuss. You have an incredible discussion and together and create an exciting vision for their next-generation marketing. You leave the lunch with a verbal agreement on a $60,000 engagement for the next three months. She goes back, gets the paperwork written up, and you’re in business. Over time, your results come in and the company decides to expand the engagement. You hire staff. Your friend next gladly recommends you to peers in her network. Your business is ignited. You “start” your business and spend a month building the perfect website, creating flyers, and getting all of your paperwork perfected. During month two, you “hit the streets,” making phone calls and stopping by businesses. You find out most people aren’t interested in the offer you put together. After a lot of rejection, you realize people want something a little different. You go back and spend the next few weeks changing your marketing and redoing your website. Month four, you hit the streets again and nail down one customer who is willing to do a $1,000 trial. You spend the next couple of weeks trying to get information and assets from them, only to realize it’s taking all of your time and you’re unable to focus on selling your next deal. Dejected and broke, you decide this whole “small business” thing is too hard. These two scenarios play out in the real world every day and mirror most success and failure stories I’ve seen. Ready to Improve Your Networking Game? By reading above, hopefully you’ve come to the conclusion that networking isn’t about building the fattest Rolodex possible. It’s about improving your relationship with the right people. So let’s keep it simple. Identify the relationships you want to improve and then deliberately work on them. This exercise is straightforward. I want you to list at least the “Top 50” people in your life. This list should be made up of friends, family, and business people. Know that these are people with whom you will meaningfully connect on a regular basis. You will ask about their lives. You will share your message. You will simply build deeper relationships, and as a result, your life will change dramatically. You can start smaller—perhaps with 20 people—but I’d like you to grow it to your Top 50 over time. If you have more people you want to list, that is fine. But I specifically want you to maintain an exclusive Top 50 group comprised of the 50 most important people in your life. Alright, grab your notebook and list the names of 20 to 50 important people in your network. These can be friends, family, or business people. The more influential they are, the better. These people will become your champions. And, name the list “Top 50,” even if it includes fewer. This will help you remember to aim for 50, regardless of how many you start with. You can have great relationships with these people already, or they can be people you need to get to know better. Nurturing these relationships will be a primary contributor to your success. Step 2: Give your Top 50 a call! Alright, get to it! Start calling your list. Notice that I said call. I didn’t say to use email, Facebook, or Twitter. This exercise is about building meaningful relationships with people. In-person meetings are best, but phone calls are a close second. In short, ask questions and let the conversation flow. Make the call about them. Let the relationship grow over time. Each conversation will get easier. If you have a hard time with this, you can quickly become a pro by reading “How to Win Friends and Influence People” by Dale Carnegie. Creating depth in a relationship won’t happen after a single call. It takes time and ongoing effort. Get in the habit of connecting with your Top 50 in a meaningful way. Set aside time weekly for phone calls. Connect in person, ideally over food, as much as possible. If you want to ease in, shoot for 10 calls per week and move up from there as fast as possible. Remember, this isn’t about sales. This is about deliberately building meaningful relationships that will change your life. Consistently be of service to your network and watch your life change as a result. Bonus – Networking Makes You Happy! As a final thought, networking for your success has a pleasant side effect…it will probably make you happy! Check out my post How to Be Happy – 8 Science-Backed and Counter-Intuitive Tips for more on this. What do you think? How do you work your network? Hit me up in the comments below.